Lángos (pronounced as lang-oh-sh) is a Hungarian flat bread made from flour, yeast, salt, water or milk, mashed potato and deep fried. Traditionally the flat bread is rubbed with garlic or sprinkled with garlic water and topped with sour cream and grated cheese. However, like most flat breads, there is no fixed topping. Pile anything onto it and make it into a wholesome meal, a snack or eat it on it own with a cup of hot tea or coffee. Sprinkle some sugar or spread jam on it and it becomes a sweet treat. It is sometimes called a Hungarian pizza. The soft dough is pressed with the fingers into a round or oval shape and fried. Traditionally lángos was baked in front of the brick oven close to the flames but these days its mostly fried. The first time I had lángos was years back during a community fair. It was made by the late Pushpa Haria, a good cook, an artist, basically an all rounder. She sold the lángos topped with cabbage salad and a sauce made from soy sauce, chilli sauce and sugar. However I actually prefer the version that I make at home. I spread either sour cream or cream cheese on the warm lángos, top it with any of the salads I have made on that day and sprinkle a generous helping of grated cheddar cheese. Its a perfect light meal. Put the flour in a big bowl. Add sugar, salt and yeast to it. Mix it up well. Add oil, garlic and the cold mashed potato to the flour. Mix well. Add the liquid and form a dough. Knead the dough for 5 to 10 minutes till it is smooth. Cover the dough with a cling film and let it rest for 30 to 45 minutes. Sprinkle some flour on the work top. Remove the dough and knead it gently. Divide the dough into 8 to 10 parts. Heat the oil in a wok or kadai over medium heat. Oil the worktop or a wooden board. Place one part of the dough on it and spread it into a round or oval shape with your fingers. I prefer to sprinkle flour and roll the dough into a 5 to 6 inch diameter circle. Roll out the rest of the dough. Make several small slits in the rolled or pressed dough. Put a tiny piece of the dough into the oil. If it comes up immediately, the oil is ready. Fry each lángos one at a time, flipping it over frequently. Fry till they are golden brown. Remove the lángos with a slotted spoon and place it on a kitchen towel to remove the excess oil. 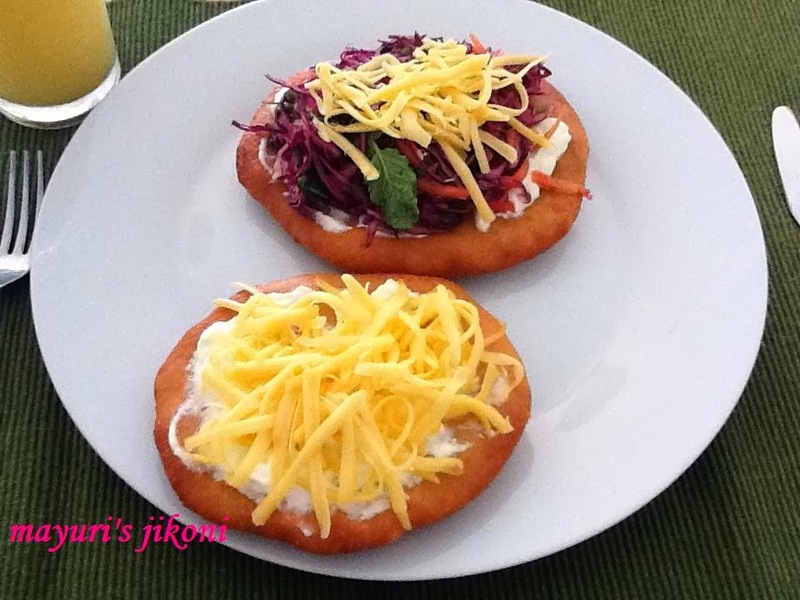 Spread the sour cream or cream cheese on the lángos. Top it with a salad or any topping you like (meat, vegetables etc). Don’t let the dough prove for too long otherwise it becomes difficult to handle. The potato makes it more softer. Adding potato to the dough gives it a nice taste but make sure the mashed potato is cold. Adding warm or hot mashed potato will make the dough impossible to work with. If you don’t want to add garlic to the dough, you can rub garlic on top or add it to the sour cream or cream cheese. Try a cold lángos with jam. It tastes yummy with a cup of tea. Do not fry over high heat as the langos will remain raw inside.